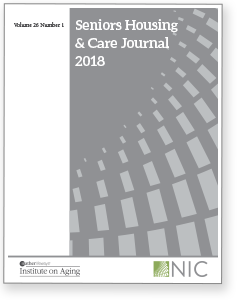 Seniors Housing & Care Journal is a peer-reviewed annual publication focusing on applied research and best practices in the fields of seniors housing and long-term care. The Journal is distributed to more than 2,000 long-term care managers, executives, and investors at the annual conference of the National Investment Center for the Seniors Housing and Care Industry (NIC). Look for the 2019 issue of Seniors Housing & Care Journal this summer. The call for paper proposals for the 2020 issue will be released in October. There are no submission or publication fees. If you have any questions about Seniors Housing & Care Journal, please e-mail Dugan O’Connor at doconnor@matherlifeways.com or call (847) 492.7437. Seniors Housing & Care Journal is an open access journal. This means that all content is freely available without charge to a user and/or his/her institution. Users are allowed to read, download, copy, print, search, or link to the full texts of the articles in this journal without asking prior permission from the publisher or the author.